If your hamster has disappeared, do not lose hope. Hamsters do escape once in a while, but, fortunately, they can be found in most cases. Have you lost your hamster? Do not despair! Some people say that their hamsters escape from time to time, but they always manage to find them. Here are some ways that you can try if your hamster got lost. 1. If you do not know what room your hamster is hiding in, leave some sunflower seeds in each. Note the number of the seeds you leave. It all should be done in the evening before you go to sleep. In the morning, if some of the seeds have disappeared, you will easily say what room the hamster is in. It will narrow your search, and then you can try one of the methods described below. But remember: once you have located the room, keep its door closed, as well as any other possible way of escaping. 2. Put some food in the cage and leave it open near the place you think your hamster is hiding. By night, the rodent may want to return in there. 3. A hamster trap. Make a slope (a wood plank, for example) up to a bucket and leave some food in the latter. Make a food trail on the floor and on the slope. When your hamster follows it and discovers the treasure in the bucket, he will probably jump down on it, so do not be greedy and put more food in the bucket. Make sure the sides of the bucket are tall enough so that your hamster does not escape again. You can put some butter on them. 4. Take a carrot stick and tie some bells to it with a long string. Leave it on the floor. When the hamster tries to catch it and escape, the bell will make a noise, and the long string will easily show your the way to the hamster. 5. Leave a pile of hamster mix (or other treats) on the floor. Make a circle of flour around the pile. 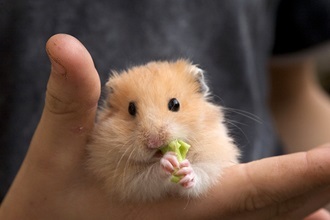 Your hamster will hardly resist the royal gift, and you will be able to find him by the tuny white paw prints. 6. Another way to find your hamster is to turn off everything that makes noise (TV, radio, fans, etc) and stand very still. After a while, you may hear your hamster moving around. How To Chose A Hamster?